Playa Vista is a neighborhood located in the Westside of the City of Los Angeles, California, United States, north of LAX, sitting just below the Loyola Marymount University campus. Prior to the development of Playa Vista, the area was the headquarters of Hughes Aircraft Company from 1941 to 1985, and was the site of the construction of the Hughes H-4 Hercules "Spruce Goose" aircraft. The area began development in 2002 as a planned community with residential, commercial, and retail components. The community has become a choice address for businesses in technology, media and entertainment and, along with Santa Monica and Venice, has become known as Silicon Beach. The Tongva Native Americans once inhabited the location now occupied by Playa Vista. There was a Tongvan sacred burial site located here: "about 1,000 Native American remains [...] had been exhumed during construction," grave sites that were deemed sacred by the Tongva people. The remains were discovered after construction had begun. In 2008, the remains "were laid to rest and covered with white seashells during a sacred burial ceremony near the Westchester bluffs." In addition, "Playa Vista plans to complete a museum dubbed the Discovery Center to educate people about the Ballona wetlands and the Gabrieliño-Tongva tribe. It is expected to be completed at the end of ." In 1839 the land was part of Rancho La Ballona, later in 1887, it became part of the Port Ballona. Prior to its development as headquarters for Hughes Aircraft Company, much of the land occupied by Playa Vista was a wetlands connected with a large salt-marsh in what is now Marina Del Rey. These wetlands were formerly part of the larger Ballona Creek watershed that occupied these areas along with what is now Playa Del Rey, and much of Venice, Los Angeles. In the 1940s, the aviator Howard Hughes bought the site and constructed a private airfield runway, named Hughes Airport, and an aircraft factory with large hangars for his Hughes Aircraft Company production. The famous Spruce Goose (Hughes H-4 Hercules plane), with the largest wingspan and height of any aircraft in history, was built in the hangar and then transported to Long Beach Harbor for its only flight in 1947. During the late 1990s, DreamWorks failed in its attempt to build a studio in Playa Vista. Phase One of Playa Vista began in 2001 as "a mix of affordable and luxury housing, office and commercial space and open spaces and recreational amenities, all set next to a restored wetlands and wildlife preserve." In October, Steve Soboroff was named president of Playa Vista. It was one of "six communities in the nation selected by President Bill Clinton in 1998 as a National Pilot Project of the Partnership for Advancing Technology in Housing (PATH)." As such it is, "one of the most technologically advanced communities ever planned" and is "fully connected via telecommunications and broadband capabilities." It was also constructed as, "a model for green development [using] energy saving systems, non-toxic and recycled materials, product selections and design techniques that promote conservation [thus] minimizing the impacts of development on the environment." 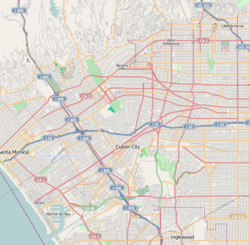 However, some environmentalists and residents in the nearby communities of Mar Vista, Westchester, and Venice oppose the development arguing that it will increase traffic congestion throughout the Los Angeles Westside. Beginning in 1994, developers and some environmentalists worked together to restore the Ballona Wetlands. Other environmentalists, however, oppose development in the wetlands. A controversy surrounding methane at Playa Vista developed around 2000. On April 17, 2000, Exploration Technologies (ETI), "found methane seeps much larger than any previously reported, one about 1,000 feet long, and a second slightly smaller, in the area east of Lincoln Boulevard and south of Jefferson Boulevard." The City Council then asked Playa Vista to conduct more studies with ETI as a peer reviewer. This study found that ETI's original hypothesis was incorrect, and stated that a fault zone did not exist under Lincoln Boulevard. The study further showed that gas seepage from the southern California gas storage facility was not occurring. The report concluded that "no significant fault is possible under the entire Playa Vista development project site." In 2002, the Los Angeles Department of Building and Safety (LADBS) required the installation of gas mitigation systems at Playa Vista, consisting of a membrane shield under the buildings, vents, and a series of alarms. According to officials at the L.A. Department of Building and Safety, "Methane is an old story in Los Angeles and the standards the city requires at Playa Vista are the strictest in the country. Hence, Playa residents we spoke to cited areas where the gas has not been mitigated - such as Venice, Santa Monica, and nearly all of the Westside - as more dangerous." Many also argue that "much of the methane is natural - not the kind that comes from the gas company." The Los Angeles City Council has consistently voted in favor of the developers of the project. The development has a government-mandated blend of high- and low-income housing (less than 10%). According to the Los Angeles Times, "[o]ver the last decade, government agencies and courts have ruled repeatedly in Playa Vista's favor [...] Engineers, builders and consultants for the project have joined the city of Los Angeles in saying the safety measures are the most elaborate the city has ever required." Playa Vista's parks and landscaped areas are serviced with 100% recycled water. The boundaries of the currently developed portion are approximately Lincoln Boulevard and the Ballona Wetlands on the west, Ballona Creek on the north, Centinela Avenue on the east, and the Del Rey Hills bluffs (Westchester Bluffs) on the south. 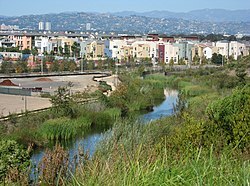 Playa Vista is bordered by the unincorporated enclave of Marina Del Rey to the northwest, by the community of Playa del Rey to the southwest, by Loyola Marymount University and the upland part of Westchester to the southwest, south, east and southeast, and by the Del Rey district to the northwest. The neighborhood was highly diverse ethnically. The breakdown was Latinos, 34.8%; whites, 32.4%; Asians, 21.2%; blacks, 4.7%, and others, 6.9%. Mexico (36.2%) and Guatemala (16.5%) were the most common places of birth for the 31.1% of the residents who were born abroad, about an average figure in Los Angeles. The median yearly household income in 2008 dollars was $68,597, a high figure for Los Angeles. The average household size of 2.4 people was average for the city. House- or apartment owners occupied 54.8% of the housing stock, and renters occupied 28.5%. The percentages of divorced men and widowed men and women were among the county's highest. In 2000 there were 33 families headed by single parents, a low rate for Los Angeles. There were 215 veterans, or 11%, a high rate for Los Angeles. Electronic Arts, a Redwood City-based major developer, marketer, publisher and distributor of video games, operates a large branch campus in Playa Vista. Belkin, since February 2010, has its corporate headquarters in Playa Vista. Team One a division of Saatchi & Saatchi relocated its corporate headquarters to Playa Vista from nearby El Segundo in March 2013. ICANN relocated its corporate headquarters to Playa Vista from nearby Marina Del Rey in June 2012. Fullscreen relocated to the complex renamed i|o at Playa Vista from nearby Culver City in March 2015. Neo@Ogilvy a subsidiary of one of the largest marketing communication companies in the world, Ogilvy & Mather relocated to the i|o at Playa Vista from the Santa Monica Water Garden. TBWA\Chiat\Day, the Los Angeles office of TBWA Worldwide, rents a 103,000 square foot  building in Playa Vista. Deutsch Inc. – Los Angeles office of Deutsch Inc., a global creative ad agency. Gehry Partners, LLP, the architectural firm of Frank Gehry. TOMS – headquarters of the philanthropic company known for shoes, eyewear, and coffee products. Rubicon HQ – Los Angeles office of Rubicon. Facebook LA – Los Angeles office of Facebook. Microsoft – Los Angeles office of Microsoft. The Honest Company – Head office. Founded by Jessica Alba. YouTube Space LA – Los Angeles office of YouTube. CTRL Collective – Playa Vista location, a coworking facility for entrepreneurs and innovators . BEZALEL – headquarters of wireless charging technology company Bezalel Inc.
Rooster Teeth – Los Angeles office of Rooster Teeth. MERRY JANE – headquarters of cannabis lifestyle-media company co-founded by Snoop Dogg and Ted Chung. IMAX Corporation – headquarters of Canadian theatre, camera, and projection company. SIE Santa Monica Studio - Sony Interactive Entertainment game development studio. The Institute for Creative Technologies (ICT), a research institute of the University of Southern California (USC) is located in Playa Vista. Established in 1999, the ICT combines the assets of a major research university with the creative resources of Hollywood and the game industry to advance the state-of-the-art in training and simulation. The Los Angeles Police Department operates the Pacific Community Police Station at 12312 Culver Boulevard, 90066, serving the neighborhood. The Los Angeles Public Library operates the new Playa Vista Branch Library with a community meeting room and public Wifi. Parks: Neighborhood parks, sports fields, and regional hiking parks, are in and adjacent to Playa Vista. In the 'Campus' area, the Los Angeles Clippers, a professional basketball team, have built a new training facility for its players. Some Clippers players live in or near Playa Vista. Los Angeles Unified School District operates public schools. Playa Vista sits just below the bluff of Loyola Marymount University (LMU) which has labeled itself as the "University of Silicon Beach". The slogan being adopted by West LA and specifically Playa Vista. LMU has a large involvement within the neighborhood as well as interacting with the many companies moving into the campus portion of Playa Vista. ^ Lewis, Amanda (January 23, 2014). "Playa Vista Was Going to Be a Utopian Planned Community. But Capitalism's Harsh Reality Keeps Creeping In". LA Weekly. ^ a b c d Abdollah, Tami & Song, Jason (December 14, 2008). "Restoring harmony with reburial of Native American remains". Los Angeles Times. ^ "Grave Disturbances: Been Digging Lately Review of Selected 2007 California Legislation: Public Resources 38 McGeorge Law Review 2007". Retrieved 25 April 2016. ^ Lin, Sara (March 21, 2004). "State Decries Removal of Remains". Los Angeles Times. ^ "Mar Vista Historical Society". Retrieved 25 April 2016. ^ Masters, Nathan (February 29, 2012). "The Lost Wetlands of Los Angeles". KCET. Retrieved 16 April 2015. ^ Purdum, Todd S. (July 3, 1999). "Spielberg and Partners Drop Long-Troubled Plan to Build Big Studio Complex". New York Times. ^ "Santa Monica News Santa Monica, Environmentalists Go to Court Over Playa Vista Expansion". Retrieved 25 April 2016. ^ "Developers and Environmentalists Join Forces on Wetlands". The New York Times. 31 July 1994. Retrieved 25 April 2016. ^ "The evolution of a Ballona friendship". Archived from the original on 2013-05-25. Retrieved 25 April 2016. ^ a b c Just How Much Gas Flows Below? ^ "Reclaimed water now irrigates landscaped open spaces in Playa Vista". Daily Breeze. April 8, 2009. Archived from the original on 2009-04-13. Retrieved 2009-04-19. ^ "Google Maps". Google Maps. Retrieved 25 April 2016. ^ "Los Angeles (EALA)". Retrieved 25 April 2016. ^ "Belkin Moves Corporate Headquarters to Playa Vista" (Press release). Business Wire. March 22, 2010. ^ "5353 Grosvenor Boulevard, Los Angeles, CA 90066". Retrieved 25 April 2016. ^ "TBWA\CHIAT\DAY". Retrieved 25 April 2016. ^ Deutsch. "Deutsch: An Integrated Advertising, Design, and Digital Agency. New York and Los Angeles". Retrieved 25 April 2016. ^ TOMS. "The One for One Company - TOMS". Retrieved 25 April 2016. ^ a b c d e f "Get to Know the Area - Playa Vista". Playa Vista. Retrieved 25 April 2016. ^ Futch, David (2016-06-30). "How Snoop Dogg Is Becoming a Marijuana Media Mogul". L.A. Weekly. Retrieved 2017-10-12. ^ "Contacts". www.imax.com. 2015-09-01. Retrieved 2019-01-25. ^ "Location". Retrieved 25 April 2016. ^ "Pacific Community Police Station". Retrieved 25 April 2016. ^ "Ballona Disovery Park - Playa Vista - Los Angeles, CA". Yelp. Retrieved 2019-01-25. ^ "Concert Park - Playa Vista - Los Angeles, CA". Yelp. Retrieved 2019-01-25. ^ "CLIPPERS: Clippers' Training Center Press Conference Transcript". Retrieved 25 April 2016. ^ "CLIPPERS: Clippers Training Center Update". Retrieved 25 April 2016. ^ "Home" (Archive). Wiseburn School District. Retrieved on April 4, 2014. "Also serving the children of employees from the surrounding aerospace, technology, travel, and entertainment industries, as well as families living in the Westchester, Playa del Rey, Playa Vista, Mar Vista, and Ladera Heights area on an interdistrict permit transfer." 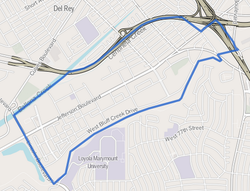 Wikimedia Commons has media related to Playa Vista, Los Angeles. Runway Playa Vista — mixed use development. Shapedscape.com: Playa Vista Central Park — project details. This page was last edited on 4 February 2019, at 22:15 (UTC).